Global Warming, greenhouse gases and their harmful effects – Urgent reduction of these are essential to save our environment: | PARTHA DAS SHARMA's Weblog on "Keeping World Environment Safer and Greener"
The earth is surrounded by a cover of gases as atmosphere. This atmosphere allows most of the light to pass through, which reaches the surface of earth. This light from sun is absorbed by the earth surface and converts into heat energy. This heat energy is re-emitted by the surface of the earth during night. Due excessive presence of some gasses in the atmosphere, this escape of heat from earth surface is prevented, resulting in heating of earth called ‘global warming’. The gasses which are responsible for causing global warming are called ‘greenhouse gasses’. a. Carbon dioxide (CO2) – A naturally occurring gas produced by living organisms and fermentation. It is a normal component of the breath we exhale; it is hazardous in concentrated volumes. Large quantity of carbon dioxide is produced by the combustion of carbonaceous fuels. Carbon dioxide emissions from fuel burning, responsible for about 87 percent of global warming, have increased by about 27 percent since the industrial revolution. b. Nitrogen oxides (NOx) – Nitrogen oxides are naturally occurring from microbial action in soil. NOx is also produced by fuel burning. Scientists say its production is increased by the use of nitrogen based fertilizers in agriculture, as well as by the use of catalytic converters in automobiles. c. Methane (CH4) – Methane is a naturally occurring, in-flammable gas. Methane is produced by geological coal formations and by the decomposition of organic matters. Leading man-related sources of methane are landfills; livestock digestive processes and waste, especially ruminants (cud-chewing animals); and wetland rice cultivation. d. Hydroflurocarbon gasses (HFCs) – Chlorofluorocarbons (CFC), the coolant, cleaning, and propellant gases were blacklisted internationally due to its ozone-eating characteristics. HFCs do contribute to global warming. Global warming potential of HFCs is 4,000 to 10,000 times that of CO2. e. Perfluorocarbons (PFC), or perflurocompounds – Man-made replacement gases for CFCs but result also as a by-product of aluminium smelting. PFCs also used as a purging agent for semi-conductor manufacture and small amounts are produced during uranium enrichment processes. Global warming potential of Perfluorocarbons (PFC), or perflurocompounds is 6,000 to 10,000 that of CO2. f. Sulfur hexafluoride (SF6) – Very low atmospheric concentration makes it an ideal test gas for gas concentration monitors. Principle uses: insulating material for high-voltage equipment like circuit breakers at utilities. Also used in water leak detection for cable cooling systems. SF6 is a man-made gas. Over last 10000 years temperature remained remarkably stable across the globe, changing by little more than 2 degree Fahrenheit on an average. Even during the ‘Little Ice Age’, which lasted from the 1300 AD to 1850 AD, which resulted advancing of glaciers, average temperatures were little more than 2 degree Fahrenheit. The effects of global warming could change average temperatures five times as much as little ice age did – though in the opposite direction. Over the next century, the rate of the effects of global warming should follow a steep upward curve. The adverse effects of global warming are enormous. The effects are already being felt on our planet, on human life, plants and animals worldwide. The predicted effects of global warming on the environment and for human life are numerous and varied. It is generally difficult to attribute specific natural phenomena to long-term causes, even though, some effects of recent climate changes already we are witnessing; rising sea levels, glacier retreat, arctic shrinkage, and altered patterns of agriculture are cited as direct consequences. Among secondary and regional effects extreme weather events, expansion of tropical diseases, changes in the timing of seasonal patterns in ecosystems, and drastic economic impact are predicted. (i) Polar ice caps melting – The ice caps melting is a four-pronged danger. (a) It will raise sea levels. There are more than 5,773,000 cubic miles of water in ice caps, glaciers, and permanent snow. According to the National Snow and Ice Data Center, if all glaciers melted today the seas would rise about 230 feet. This may not happen at once; but sea level will rise certainly and consequently, low lying areas will be submerged. (b) Melting ice caps will throw the global ecosystem out of balance. The ice caps are fresh water, and when they melt they will desalinate the ocean, or in plain English – make it less salty. The desalinization of the gulf current will distort ocean currents, which regulate temperatures. It will give very confusing and irregular pattern of cooling and warming effects in some areas. (c) Temperature rises and changing landscapes in the artic circle will endanger several species of animals. Only the most adaptable will survive. (d) Global warming will certainly reduce ice caps substantially. Ice caps are white, and reflect sunlight, much of which is reflected back into space, further cooling Earth. If the ice caps melt, the only reflector is the ocean. Darker colors absorb sunlight, further warming the earth. (ii) Increased probability and intensity of droughts and heat waves – Although some areas of Earth will become wetter due to global warming, other areas will suffer serious droughts and heat waves. Africa will receive the worst of it, with more severe droughts also expected in Europe. Water is already a scarce commodity in Africa, and global warming will worsen the conditions. (iii) Warmer waters and more hurricanes – As the temperature of oceans rise, so will the probability of more frequent and stronger hurricanes. (iv) Spread of disease – As northern countries warm, disease carrying insects migrate north, bringing plague and disease with them. (v) Economic consequences – Most of the effects of global warming will not be good. These effects bring economic consequences badly for almost all the countries of the world. (ii) Other 18% came from a decline in the natural ability of land and oceans to soak up CO2 from the atmosphere, i.e., decline in global carbon sinks. In addition, the growth of global population is responsible for significant growth of atmospheric CO2, as well. A. The decline in global sink (there are two major carbon sinks in the biological cycle: the oceans and the land “biosphere”, which includes plants and the soil) efficiency suggests that stabilization of atmospheric CO2 is even more difficult to achieve than previously thought. Study suggests, about half of emissions from human activity are absorbed by these natural “CO2 sinks” but it has been observed that, the efficiency of these sinks has fallen. Scientists believe global warming might get worse if the oceans soak up less of the greenhouse gas. B. The weakening of the Earth’s ability to cope with greenhouse gases is thought to be a result of changing wind patterns over seas and droughts on land. Nearly half of the decline in the efficiency of the ocean CO2 sink is, expected, due to the intensification of the winds in the Southern Ocean, study suggests. The declining effect is also being seen in the North Atlantic, as per the recent study. C. In fact, the researchers are clueless about the exact reasons, whether this change in behavior of ocean is due to climate change or to natural variations. It is a tremendous surprise and troublesome factor because there were grounds for believing that in time the ocean might become ‘saturated’ with our emissions – unable to soak up any more. This phenomenon of ocean being saturated, leave us with all our emission to heat-up our globe – results rapidity in global warming. D. We have to find out the ways to deal with this rapid pace in global warming. Implementation of carbon sink technology, iron fertilization of Southern oceans etc., have to be thought of. The major responsible factors such as, the issues like reduction of emission of greenhouse gasses in the atmosphere are to be tackled efficiently. A. Climate change is a global issue that affects us all. Changes in climate patterns mean that extreme weather events such as heat waves, floods, storms, droughts and bushfires will become more frequent, more widespread or more intense. Climate change science is providing a better understanding of the causes, nature, timing and consequences of climate change. Climate change science is a very complex subject. Various investigations, studies, reports suggest that world is warming up, but how this will affect us in the future is difficult to qualify. Climate change is the result of changes in our weather patterns because of an increase in the Earth’s average temperature. The weather elements at a given location vary from time to time throughout the year, but generally are expected to remain within set limits over a long time period. This is known as our climate. This natural variation in temperature ensures we have cold and warm years. This is actually a natural and essential feature of our atmosphere without which our planet would be uninhabitable. B. If go back to history of climate change and find people behind postulating the probable cause of it; we may more or less say that in the 1930s people started realizing that the United States and North Atlantic region had warmed significantly during the previous half-century. Scientists supposed this was just a phase of some mild natural cycle, with unknown causes. Only one lone voice, the amateur G.S. Callendar, insisted that greenhouse warming was on the way. In the 1950s, Callendar’s claims provoked a few scientists to look into the question with improved techniques and calculations. The new studies showed that, contrary to earlier crude estimates, carbon dioxide could indeed build up in the atmosphere and should bring warming. Painstaking measurements drove home the point in 1961 by showing that the level of the gas was, in fact, rising, year by year. In the early 1970s, the rise of environmentalism raised public doubts about the benefits of human activity for the planet. Curiosity about climate turned into anxious concern. Alongside the greenhouse effect, some scientists pointed out that human activity was putting dust and smog particles into the atmosphere, where they could block sunlight and cool the world. Most scientists agreed on that they scarcely understood the climate system, and much more research was needed. Research activity did accelerate, including huge data-gathering schemes that mobilized international fleets of oceanographic ships and orbiting satellites. People have come to know that, this is caused by increases in greenhouse gases in the Earth’s atmosphere. By 2000, scientists knew the most important things about how the climate could change during the present century. 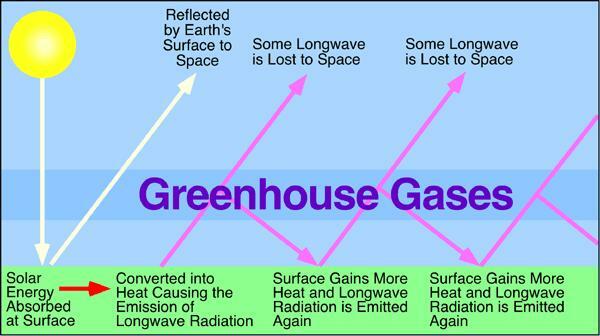 C. Therefore, when we talk about global warming, as described above, we generally talk about the ‘greenhouse effect’. This process works by the principle that certain atmospheric gases (called greenhouse gases) allow short wave radiation from the sun to pass through them unabsorbed, while at the same time absorbing some of the long wave radiation reflected back to space. The net result; more heat is received from the sun than is lost back to space, keeping the earth’s surface warmer than it would otherwise be. Man, in the process of industrialization and development, is adding to and changing the levels of the gases responsible for the greenhouse effect and is therefore enhancing this warming. D. The effect of global warming is that, global ice sheets have decreased, so has global snow cover. There have been warmer periods in the history – some millions of years ago. However, the present rise is the most rapid rise in temperature since the end of the last ice age. Carbon dioxide (CO2) is the gas most significantly responsible for greenhouse effect. Plant respiration and decomposition of organic material release more than 10 times the CO2 than released by human activities, but these releases have generally been in balance during the centuries. Since the industrial revolution amounts have increased by 30%. 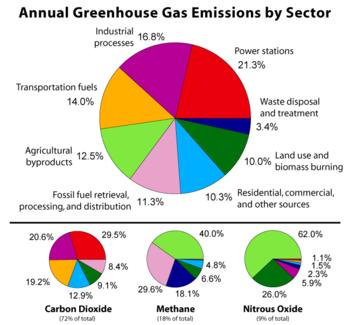 Other greenhouse gases include Methane, Nitrous oxide, CFC’s (manmade) and Ozone. The major problem is that these gases can remain in the atmosphere for decades. The combustion of fossil fuel (oil, natural gas and coal) by heavy industry and other human activities, such as transport and deforestation, are the primary reasons for increased emissions of these harmful gases. Aerosol, from human made sulfur emission, also increases in the atmosphere along with CO2. The small particles of aerosol have a property to reflect back some of the sunlight and hence act to slow down the cooling. However where carbon dioxide can remain in the atmosphere for 100 years, sulfate aerosols only last a few days and can be easily removed by rain (acid rain). Therefore they only temporarily mask the full effect of CO2. E. In order to try and predict possible consequences of this warming for the future, researchers use climate modeling to simulate the climate and oceans over many decades. Climate models also predict changes in rainfall and rise in sea level. Sea level rises will be due to thermal expansion of the ocean along with the melting glaciers and mountain snow and ice. 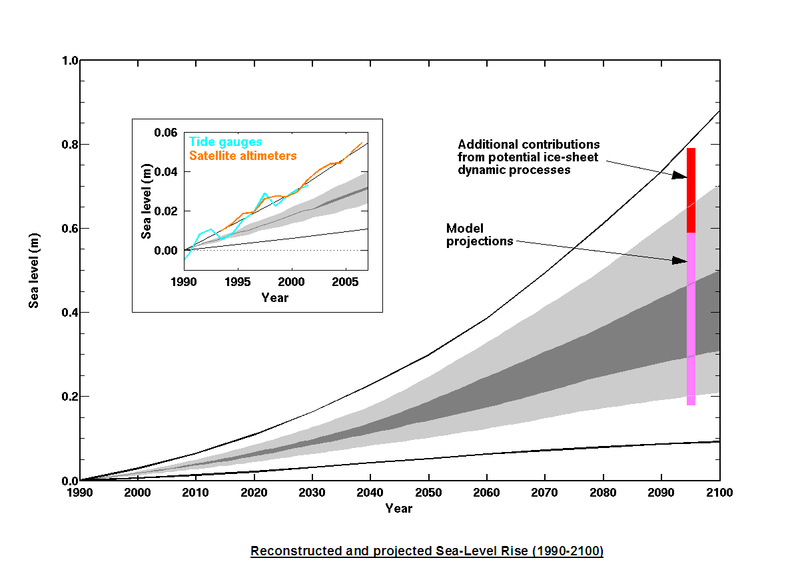 The recent estimate of sea level rise is by more than 50cm by 2100, but this will vary considerably with location. (i) Most places will continue to get warmer, especially at night and in winter. The temperature change will benefit some regions, at least for a time, while harming others like, patterns of tourism will shift. The warmer winters will benefit health in some areas, but globally, mortality will rise due to summer heat waves and other effects. (ii) Sea levels will continue to rise for many centuries. The last time the planet was 3°C warmer than now, the sea level was roughly 5 meters higher. That submerged coastlines where many millions of people now live. Also, storm surges will cause emergencies. (iii) Weather patterns will keep changing, probably toward an intensified water cycle with stronger floods and droughts. Most regions that are now subject to droughts are expected to get drier (because of warming as well as less precipitation), and most wet regions will get wetter. Changes in extreme weather events are hard to predict, but in some regions storms with more intense rainfall are liable to bring worse floods. Mountain glaciers and winter snowcap will shrink, jeopardizing many water supply systems. Each of these changes has already begun to happen in some regions. (iv) Ecosystems will be stressed, although some managed agricultural and forestry systems will benefit, at least in the early decades of warming. Uncounted valuable species, especially in the Arctic, mountain areas, and tropical seas, must shift their ranges. Many that cannot will face extinction. A variety of pests and tropical diseases are expected to spread to warmed regions. Each of these problems has already been observed in numerous places. (v) Increased carbon dioxide levels will affect biological systems independent of climate change. Some crops will be fertilized, as will some invasive weeds (the balance of benefit vs. harm is uncertain). The oceans will continue to become markedly more acidic, gravely endangering coral reefs, and probably harming fisheries and other marine life. (vi) There will be significant unforeseen impacts. Most of these will probably be harmful, since human and natural systems are well adapted to the present climate. 6. Abnormal rise in greenhouse gas, methane, in the earth atmosphere causing arctic ice to vanish in a couple of years!! It has been reported that, due to rapid, unchecked and unethical industrialization in many parts of the globe, the concentration of methane, a very prominent greenhouse gas, has been rising and in last one year alone it has risen by about 0.5%. We all know that, methane is the second most important gas causing man-made climate change. Each molecule causes about 25 times more warming than a molecule of CO2, though it survives for shorter times in the atmosphere before being broken down. Further, it has also been known to us that, already global climate is at great disastrous condition because of present rise in carbon dioxide (CO2) levels, which is significantly higher than the average annual increase for the last 30 years. It has also been recently reported that, CO2 concentration has risen by 2.4 parts per million (ppm) in last one year; as against the average annual increase of 1.65ppm between 1979 and 2007. Thus, it shows evidence that, concentrations of greenhouse gases are rising faster than they were a decade ago. The methane concentration figure is more awesome and potentially of more concern. Because of the above abnormal rise in greenhouse gases in last one year or so, scientists fear that, it could reflect melting of permafrost and drying of tropical wetlands more rapidly. It has also been reported that, concentrations of greenhouse gases have been more or less stable since about 1999 and thereafter rapid increases. Industrial reforms in Asia, Europe and South American countries in last one decade reflected abnormal rise in greenhouse gases, especially of carbon dioxide and methane. Changes of methods rice farming processes and the capture of methane from landfill sites contributed to this rise, it is felt. Also, possibilities of release of methane from frozen zones of the world, notably the Arctic permafrost, as they warm cannot be ruled out. The rapid unchecked increase in coal fired industries (without cleaning coal) such as power plants, steel plants etc., are mostly responsible for rise in concentration of CO2. The sustained rise of greenhouse gases along with El Nino and La Nina (opposite of El Nino) conditions, the earth is experiencing warming effects. As per the new scientific analysis, because of the warming, the arctic snow melted most rapidly in last one year. They also predict that, the sea level could rise by more than one and half meters by another half century or so. Sea level rise of this magnitude would have major impacts on low-lying countries such as Bangladesh. Scientists also fear that, due to abnormal rise in average global temperature, in next five of six years there may not be any arctic ice left during summer. A. It has been reported recently by some of the climate research agencies in US, Australia, UK etc. that, oceans all over the world are getting warmed at a much faster rate than it used to be earlier or what was thought to be. It is estimated that, the rate of warming of world’s oceans is about 50% faster over the last half century than it was thought previously. Thus, world’s oceans have warmed more quickly due to climate change than expected. B. It may be noted, higher the ocean temperatures, higher the expansion of ocean water – which contributes to rise in sea levels. Expansion ocean water means more floods, submerging smaller island nations, threatening to wreak havoc in low-lying places and densely-populated delta regions around the globe. A third of the world’s population living within 50 km of the coasts and a great proportion and a large proportion of them live much closer to the shoreline. Even a modest sea level rise could inundate low-lying regions, accelerate coastal erosion and force the relocation of communities and infrastructures. C. Rising sea levels are driven by two things – (i) the thermal expansion of sea water, and (ii) additional water from melting sources of ice. Both these processes are caused by global warming. D. For example, the glaciers or ice sheet that cover Arctic region contains enough water to raise world ocean levels by seven meters, which would bury sea-level cities from Dhaka to Shanghai in Asia and many more similar cities in other parts of the world. If the Greenland and the West and East Antarctica ice sheets were to melt, it would be enough to raise the sea level by approximately 65 meters. A one-foot rise in sea level might well translate to a 200-foot retreat of shoreline. Therefore, it could be imagined about the future coastal map how catastrophic it would be. Among the most vulnerable are countries with large populations in deltaic coastal regions such as Bangladesh, Vietnam, China and Egypt. Two populous island nations, the Philippines and Indonesia, have millions who face displacement from their homes from sea level rise. Several small island state nations including the Maldives in the Indian Ocean and the Marshall Islands and Tuvalu in the Pacific could face extinction. 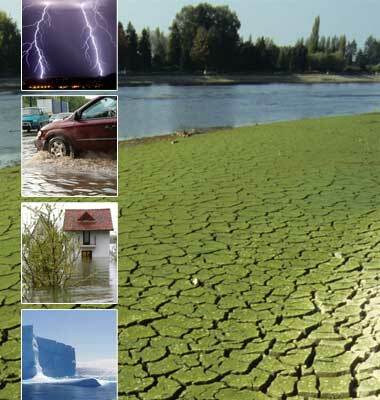 E. Global heating effects are strong in melting of snow and ice, rising global mean sea level, widespread changes in precipitation amounts, ocean salinity, wind patterns and aspects of extreme weather including droughts, heavy precipitation, heat waves and the intensity of tropical cyclones. The rate of rise in temperatures depends on if and how fast emissions are reduced and on possible adverse feedbacks in the climate system. Temperatures are sure to rise faster in the next decades as well. Experts opine that, hot extremes, heat waves, and heavy precipitation events will continue to become more frequent. It is certain that the ocean would become more acid from taking up more carbon dioxide. F. Therefore, it is very important, now, to figure out and estimate how much each of these factors contributes to rising sea levels. Further, it is critically important to understand global warming, climate change and forecasting future ocean temperature rise, as well. The fact is, up to now there has been a perplexing gap between the projections of computer-based climate models, and the observations of scientific data gathered from the world’s oceans. 8. Global Warming – Each one degree rise in the temperature of the world’s oceans is equivalent to 1.4 BILLION one Megaton atom bombs!!! We all know, the earth is surrounded by a cover of gasses as atmosphere. This atmosphere allows most of the light to pass through, which reaches the surface of earth. This light from sun is absorbed by the earth surface and converts into heat energy. This heat energy is re-emitted by the surface of the earth during night. Due excessive presence of some gasses in the atmosphere, this escape of heat from earth surface is prevented, resulting in heating of earth called ‘global warming’. The gasses which are responsible for causing global warming are called ‘greenhouse gasses’. Carbon dioxide is one of the most important greenhouse gases. This carbon dioxide mostly comes to atmosphere as air pollution from vehicles, coal-fired power plants and other industries burning fossil fuels. Human population increase and large scale deforestation are also responsible for carbon dioxide generation. Thus, Global Warming adds energy to the Earth’s biosphere. The climate change which we are experiencing is due to global warming. Heat is the fuel of weather systems. More heat, more extreme weather. Energy drives the water cycle. The more energy there is the faster the water cycle is driven and the more extreme the weather patterns become. Each one degree rise in the temperature of the world’s oceans is the equivalent to 1.4 BILLION one Megaton atom bombs; that is a lot of energy! This tremendous amount of devastating energy, generating because of our faulty creation “Global Warming” is responsible for the present climate change. Thus, it shouldn’t be surprising that the result is more extreme weather. More rain, more drought and more storms. The harmful effects of presence of greenhouse gasses in atmosphere are global warming, climate change, ozone depletion, sea level rise, adverse effects on biodiversity etc. Therefore, our prime responsibility is not to promote any industrialization which enhances carbon emission, rather than reduction. WE MUST REDUCE OUR CONSUMPTION OF NON-RENEWABLE RESOURCES. WE MUST REDUCE THE GREENHOUSE GASES WE RELEASE. Excellent presentation of the facts. We often find ourselves singing to the choir in concern and explanation of these facts to those of us only in the environmental community. In order that the vast majority become aware and through knowledge become inspired to be firstly; part of the solution as we are all part of the problem; and secondly, become the parade of concern that our global politicians will want to walk in front of, the required oucome to save the future and the lives of our children, will not result. In my book http://www.strategicbookpublishing.com/ZEROGreenhouseEmissions.html I appeal to every mother of every child, every father of every child, every grandparent of every child; to be ‘called to arms’ for the good of the future we MUST secure. For You and Yours – For Me and Mine – For Them and Theirs. We are on an illogical sleepwalk from which we need a collective awakening. Collective vision, collective action, for our collective futures. very good and encouraging article. wish all people could for once,even just for a minute have a positive attitude towards the environment, it can really make a difference. The govt & corporate bodies are care free about our DEAR Environment, they feel with all impunity that its a normal thing to generate WASTE. And leave it to the helpless Environment to take care of. Imagine companies will dump their untreated waste in drains,rivers,Oceans,atmosphere& the Soil. We all feel that it doesn’t matter. A DAY OF REWARD IS JUST AROUND THE BACKYARD. Your article is good,keep it up. Your means of describing all in this post is genuinely pleasant, all be able to effortlessly understand it, Thanks a lot. Excellent work,can be understood by all. Actually informative , and need to be disseminated among people,society,countries i.e. to educate to minimise our need , only to sustainable use of all resources to keep a own health in order as well as others. Thank you for providing such environmental issues that is the concern of world today.So keep it providing such information . Thank you for these important updates.